The Sun City Anthem Amateur Radio Club members have elected a new slate of officers for the upcoming year. Taking the reigns as President of the club will be Don Usher KD6DAK and Eric Nansen N6YKE will serve as the Vice-president. ​The club is updating their by-laws and is working on plans for new and interesting programs for the coming year. Tonight the Sierra Nevada Amateur Radio Society will honor Don Seibert, N2MOO/SK with two nets. ​One starting at 7:30pm on the SNARS Linked Systems - 147.210, 147.030, 147.150, 444.875, 146.670. The second net will be held at 8:00PM on the SNARS DMR Talk Group 31328 for those who are in outlying areas and may not able to access the local system. All check-ins will be recorded and placed in honor of Don, N2MOO in the October Edition of the "Cracklin Static", SNARS monthly newsletter. ​Don Seibert N2MOO of Reno passed away early Sunday. Don is remembered for his service as Vice-President of SNARS, as a Volunteer Examiner, and as one of the principal backers of bringing DMR activity to Northern Nevada. N2MOO was extremely active on DMR enabled repeaters until he became the victim of a catastrophic car accident on New Years Day in 2016. The accident left N2MOO, who also suffered from Multiple Sclerosis, completely paralyzed. Don is survived by his wife Donna and children Jennifer, Jamie, Sonya, and Carly, his father Atwood, brother Barry, sister Dorothy, grand children Alexis, Lil John, Nathan, Harry, and numerous nieces and nephews. 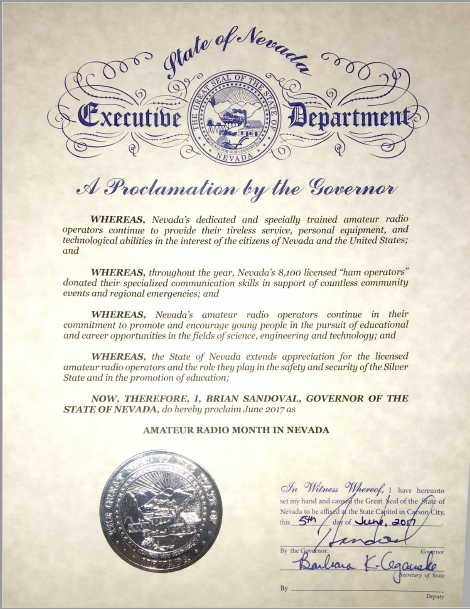 Governor Sandoval declares June as "Amateur Radio Month in Nevada"
It is with great personal sadness that I must report the death of longtime Emergency Management, Communications Officer, Fred Jones. Fred passed away suddenly on Saturday, May 20, 2017. Fred had served the people of Nye County since 2004. He had previously served as a driving instructor at Spring Mountain Motorsports, a shooting instructor at Frontsight, spent years serving with the Nye County Sheriff’s Search and Rescue, and as a Nye County HazMat Technician. Fred was also, a longtime HAM radio operator (W7LAT). A hobby obtained from his father. Fred had recently obtained his father’s radio sign, of which he was quite proud. Fred had been deeply involved with Nye County ARES/RACES for many years. Fred was a retired police officer from Anchorage, Alaska. Through the Anchorage Police Department, Fred had become the departments mobile communications coordinator, an acclaimed dignitary/executive protection driving instructor, and was a decorated survivor of multiple violent encounters, which included an off-duty gunfight with bank robbers and a large animal encounter while guarding an Easter egg hunt in a city park. Fred participated in the departments Explorer program for many years. He provided leadership and mentoring to many young men and women who used that exposure to enter law enforcement. Fred was known for his kindness, willingness to help, his love of animals, his broad skill sets, his loyalty to friends, and his quick-witted humor. Fred Jones brought ideas and skills that have improved the lives of the people of Nye County through his dedicated work. Fred leaves a sister, his wife Joni, and many friends. Joni brought much love and value to Fred’s life and he to hers. Fred leaves an enormous void in our earthly life, but our hearts and minds will rejoice in the memories he gave us. The Nevada Section is saddened to report the passing of Joe Christensen WB7WTS of Lund, Nevada. Joe passed away this morning after a lengthy illness. Joe was a retired radio technician for the Nevada Department of Transportation and was well known across the state as were the many, many amateur repeaters which Joe built and operated throughout the state. Joe was active as a member of the Eastern Nevada Amateur Radio Society and the ARRL up to the time of his illness. No memorial information is available at this time. More than 103,000 broadcasting industry professionals from around the world made their way to Las Vegas last week to take part in the National Association of Broadcasters annual convention. Several thousand of these attendees were hams. Nevada ARRL volunteers, under the direction of Nevada Section Manager John Bigley N7UR, assisted by Section Public Information Coordinator Chuck Farnham WD6CHC, were on hand to greet the visitors and to assist them with their questions regarding ARRL membership and benefits, FCC regulations, licensing, operating activities, and other amateur radio topics. A large number of those hams stopping by the ARRL booth were international visitors, including Ajaya Gupta VU2DED of Mumbai, India who presented the Nevada hams with a statuette of the State Emblem of India, which was adopted when India became a republic in 1950. The statuette was displayed in the booth for the duration of the convention. Other countries represented by visitors to the booth included Germany, Italy, the United Kingdom, China, South Korea, Brazil, the Netherlands, Japan, Canada, Mexico, Australia, and New Zealand. On Wednesday evening Nevada amateurs also joined hundreds of their colleagues from around the world at the annual Amateur Radio Operators Reception hosted by the NAB, DX Engineering, Broadcast Supply Worldwide, and Turner Engineering. Section Manager Bigley addressed the crowd, welcoming them to Las Vegas. During his remarks Bigley acknowledged the hard work of the ARRL volunteers in staffing the booth and thanked the crowd for their continued support of the NAB convention, and for making Las Vegas and the ARRL Nevada Section a part of their event. In a related fun activity, the Sisterhood Of Amateur Radio (SOAR) took advantage of the long lines of hams waiting to get into the reception ballroom. The waiting time to get into the party coincided with the scheduled weekly 2 meter net of SOAR. In so much as many of the SOAR members were at the convention to assist with ARRL activities, net control was shifted to the convention site and SOAR members canvassed those hams waiting in line to check into the SOAR net to set a record setting, visitors check-in. One hundred and sixty visiting hams were added to the evenings log. The vigil is nearly over for those amateurs who have been eagerly awaiting the arrival of the new GigaParts showroom in Las Vegas. The doors will officially swing open with a "Grand Opening" celebration scheduled for Saturday April 29. The event will feature food and refreshments as well as door prize drawings. Representatives from ham radio manufacturers will be on hand. Company officials including GigaPart's President will be present to welcome the amateur community to their new facility. The Las Vegas area has been without an amateur radio store for 8 months following the closing of Amateur Electronics Supply last July and Radio World a year prior to that. Flood threat lessens, Emergency Operations Centers and Nevada ARES begin stand down. Governor Brian Sandoval had declared a "State of Emergency"
With the threat of additional widespread damage diminshing, emergency managers in Northwest Nevada began Monday evening to dismantle the defenses which they had in place to battle the worst weather event in 11 years. A once in a decade "atmospheric river" flowing across a narrow band of the Sierra Nevada mountain range brought snow, followed by rainfall in excess of 13 inches to northern portions of Nevada and California. The heavy rainfall caused the snowpack in the Sierra's to melt, initiating avalanches, mudslides, washed out roadways, and heavy flooding. Weather experts with the National Weather Service and The National Oceanic and Atmospheric Administration had predicted that this weather event would bring flooding which would exceed similar events in 1997 and 2005. The 1997 flood resulted in $600 million in damages while the 2005 flood caused around $50 million in losses. The atmospheric river was said to be holding 15 times as much moisture as the Mississippi River empties into the Gulf of Mexico. Because forecasters were able to detect and predict the magnitude of the storm well in advance, the Reno area had time to prepare prior to the storms arrival. Sandbagging and other operations were in full force on Friday. County emergency operation centers, such as the Regional Emergency Operations Center (REOC), which serves as a joint facility for Washoe County and the cities of Reno and Sparks, began activating early Friday morning. Amateur Radio Emergency Service personel took up their positions at the REOC as well as in Storey, Lyon, and Douglas counties. Under the direction of Section Emergency Coordinator Glenn Hale KB7REO, ARES stations in all of Nevada's remaining counties activated a monitoring response on 40 and 75 meters HF, Echolink, IRLP, and DMR. City and county officials began declaring their jurisdictions to be under a "State of Emergency". On Saturday Governor Brian Sandoval also declared the region to be under a "State of Emergency". Shelters were opened in two Reno high schools and voluntary evacuations were begun. Throughout the weekend ARES communicators manned their posts. On Sunday the fire station at Truckee Meadows experienced a power failure and lost communications. Washoe County Emergency Coordinator Bob Miller WA6MTY dispatched an ARES member to the station to provide communications. A statewide ARES resource net continued in support of the response with 60 meters and Winlink added to the toolbox. The statewide net also included the California counties of Alpine, Mono, and Inyo. These counties operate as a part of the Nevada Section as the Sierra East District. The Sierra Nevada mountain range makes it impossible for these counties to communicate with their own California sections, so for purposes of emergency communications they are annexed via MOU's to the Nevada Section ARES/RACES. In Reno the Truckee river reached a crest of 12.3 ft at 12:45 Monday morning and a crest of 19.5 ft was recorded at 7:15 am in Sparks, Nevada. The river is now below flood stage and despite a forecast of more rain and snow, the river is expected to remain below flood stage. ARRL Nevada Section Manager John Bigley N7UR praised the ARRL Field Organization, "When this past weekends weather threatened property and lives in our state, the ARRL Nevada's Emergency Coordinators, ARES members, and NTS stations stood ready to provide the communications safety net for 'when all else fails '. " GigaParts opens western United States distribution center in Las Vegas......retail showroom to open within months! Online amateur radio super-supplier GigaParts of Huntsville, Alabama has announced that they have opened a new distribution center for the western United States and are close to opening a retail showroom in Las Vegas. A GigaParts Press Release states that several former employees of the now defunct Amateur Electonics Supply (AES) store will staff the new facility. Huntsville, Alabama, January 6, 2017--After Amateur Electronic Supply went out of business in July, GigaParts began hiring the AES staff in Las Vegas and working on moving the operation to a new location less than 5 minutes from the famous Las Vegas Strip and just 3 miles from the former AES building. Although the retail showroom won't be ready for visitors for another few months, starting today, the Las Vegas store becomes the primary distribution center for GigaParts shipments to the western half of the US. That means fast, affordable shipping to the huge population of hams in California and other western states, without sales tax! Navy/Marine Corp MARS Station Manager shares the memory. Debbie Reynolds and Marine Ed Riley K9HSS work phone patches from Vietnam at the MARS station set up at the 1967 SAROC convention in Las Vegas. Actress Debbie Reynolds who passed away last week was a longtime Las Vegas headliner and casino owner. What many people do not know is that she was also a friend of amateur radio in Nevada. During the late 1960's and early 1970's she attended the old Sahara Amateur Radio Operators Convention (SAROC) in Las Vegas. Miss Reynolds enjoyed being a third party operator at the Navy/Marine Corps MARS, especially when they were handling phone patches from Vietnam. The picture in this article shows Miss Reynolds in January 1967 keeping the RF portion of the QSO going while MARS station manager, Marine Ed Riley K9HSS sets up the landline connection portion of a phone patch. K9HSS. Ed is still a very active ham, operating from his big antenna farm in Wisconsin. In a 2013 letter (printed below) to ARRL Nevada Section Manager John Bigley N7UR, Ed Riley shares his memories of Debbie Reynolds and the MARS station on the Las Vegas strip. Just 23 yrs old ! Approximately 12-15 day's left of my 4 yr enlistment. Shocking you even have this picture! Henry Radio in Anaheim, California loaned all the Collins equipment, brand new in the box's! I just signed my name for it! Amazing story! I knew Walt Henry personally! Thousands of people saw/listened to the direct phone patch's, camera's flashing steady! People from around the world hugging Debbie, and me. Tri-x Corp loaned my boss, and I 80' push button nestled tower --On a trailer ) installed from the trailer....I believe a 6 element beam Mono bander! Everything borrowed free ---------all my meals, housing, transportation, entertainment paid ---------Including escorted with 2 beautiful girls every night --7 nights -------and their meals paid, all entertainment paid by the city mayor! Anything we would like -----!! The key to the city anywhere ......!! It was like living a dream of all dreams ! he number of licensed amateur radio operators in Nevada countinued to inch upward during 2016. On December 31, the FCC database showed that Nevada has 7,451 individually licensed operators. Despite a sizeable number of Silver State hams becoming Silent Keys during 2016, Nevada showed a net gain of more than 250 people, a growth in the ham operator census of more than 3 1/2 percent. In addition to the above figures Volunteer Examiners in Nevada also played a role in helping to boost the ham populations in other states via the licensing of more than 365 out of state attendees of the 2016 DEF CON convention in Las Vegas. The Sisterhood Of Amateur Radio (SOAR) has named the 2016 recipient of their annual Legacy Award and this years honoree is one of their own. 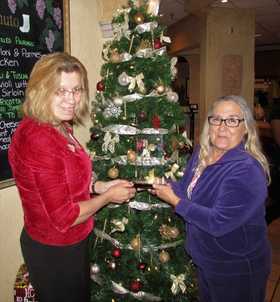 Elizabeth Bigley KD7RIN, a co-founder of the organization and president of the Las Vegas Chapter, was presented the award during a December 17th Holiday luncheon hosted by the group in Henderson, Nevada. The SOAR Legacy Award seeks to honor those women who have made a significant contribution to the advancement and continuation of amateur radio, especially among women and girls. SOAR members are located throughout the United States and in number of foreign countries. Bill Foster NR7H of Reno passed away Saturday evening November 26. Bill, who was well known in the Nevada amateur radio community, had been battling cancer for several months. NR7H was an ARRL member and was associated with several radio groups in the Reno area. His wife of 54 years, Carol KE7I and his daughter Anita KG7GTV, both of Reno are also licensed amateurs. No memorial service information is available at this time. The Amateur Radio of Churchill County Nevada ARRL affiliated club activated a special event station over the weekend of 11/5 -11/6 2016 commemorating the 53rd anniversary of the Project Shoal underground nuclear test with the call sign N7S. Their unique overnight remote operating location at the actual test site made it an adventure and a test of "off the grid" operating at it's finest. Congratulations to the team: Rick Bischoff K7ET, Curt Andersen KG7TQV, Jim Shampine K7BBJ, Dale Palm W7DPN, Jim Stewart KD6HE , Ron Sullivan N7RES and the rest of the ARCC members for an event that will not soon be forgotten.